Ford is on a roll even though their sales are dismal. You got to give it to Ford CEO Alan Mulally, he saw the writing on the wall a couple of years ago and took measures to change the way Ford does business. And he doesn't seem to be your average, buttoned down CEO. If a recent picture in Automotive News is any indication, Mr. Mulally isn't afraid to show some emotion. Evidently when President Obama remarked that he had a Ford hybrid sitting in his garage and that it runs great, Mulally pumped both fists in the air! You gotta love a CEO that truly is excited about his company's product. I just got out of a Escape Hybrid, and yes it is a very good car. I think Ford has found it's way - quality is top notch, not just a slogan (remember, "Quality is Job #1"?). It's hard to judge quality with a press car - they are supposed to be perfect - but I look at fit and finish, the feel of the materials, the tightness of the body, all the things that people care about but may only sense. I have no trouble recommending Ford products to friends and family. 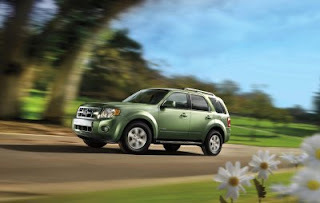 The Escape Hybrid is a good choice if you need room - it is a small SUV. The seating position is excellent; high enough to have a good view of the road yet just the right height for easy entrance. Four doors make it easy for passengers too. The Escape is big enough to carry five and small enough to make parking a snap. Fuel economy is estimated at 34-mpg city and 31-highway. My average was a bit lower than the highway (mid-20s) but still decent for a vehicle this size. The price of my test Escape was $35,000 +/- but given the state of the industry you can probably get a better price if you bargain hard.